Calm wins the coveted title of App We Love this week. In the push to be more productive – and we are all about being more productive – sometimes you have to take a breath, pause, and refocus. Calm helps you find your moments of calm, one guided session at a time. You can learn the beneficial practice of meditatation, increase your focus and get help switching off. It’s your own little antidote to modern chaos. Named iPhone app of the year in 2017 by Apple, Calm asks you to select your goals when signing up, from increasing focus and reducing stress to building self-esteem and developing gratitude. Delve into whichever guided meditation series suits you: the Focus series, Deep Concentration series or perhaps Mindfulness at Work. More casual users enjoy ‘The Daily Calm’, a 10-minute guided sessions which explores a different theme each day. Struggle to switch off at night? Calm’s Sleep Stories gently pull your attention away from stresses of the day and lull you into slumber with a softly spoken tale. Sleep Stories include a walk through Provence lavender fields with narrator Stephen Fry, and the tale of the Seventeenth Princess read by Stephen Lyons. They have a great sense of humor too – Cricket Explained is a Sleep Story that explains the rules of cricket, and Once Upon a GDPR is a sleep-inducing reading of the General Data Protection Regulation. Other Sleep Story categories include kids, naps, ASMR and non-English. If you enjoy working to ambient sound, Calm has a library of sounds to explore. From ocean waves and babbling brooks to city rain and crackling campfires, you’ll find something to accompany you while you work. Calm Body is a benefit of Calm Premium. It focuses on using movement to release tension, using gentle 10-minute videos designed to “create the balance of mobility and stability that your body needs”. The Back Care video is great if you spend much of the day at your desk and the Evening Wind Down can be an easy addition to your bedtime routine. If you want to add ‘de-stress’ to your busy schedule, Calm is a great place to start. 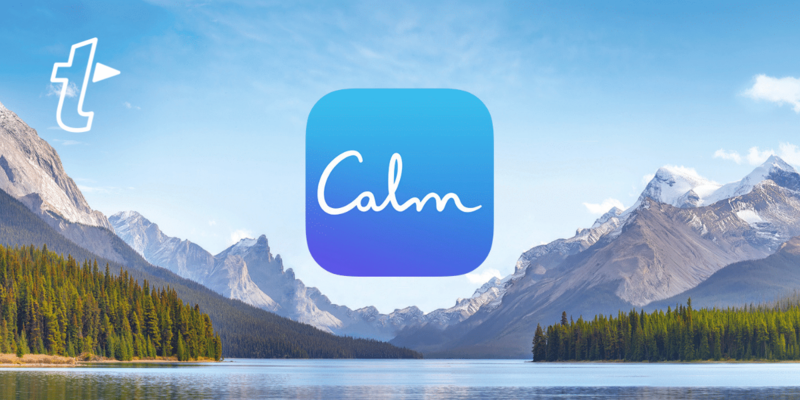 The Calm app is available for free now on iOS and Android. There are two tiers available. The free tier and includes the initial 7 Days of Calm, unguided sessions, a few guided sessions and tracking features. Calm Premium includes 100+ guided meditations for focus, stress, sleep and more, along with exclusive music tracks, Daily Calm sessions and access to Calm Body. Calm Premium costs $12.99/month, $59.99/year and $299.99 for a lifetime subscription. If you’d like to tell us your thoughts on Calm or want to share your own favorite apps, Let us know in our Facebook group.